While everyone was speculating whether Melania Trump was trying to send a message by wearing a provocative Zara jacket when departing for a trip to the border, she doubled-down by wearing it on her return trip too. President Trump weighed in as well, saying on Twitter that it was a message aimed squarely at the media. The text on the back of the jacket -- "I REALLY DON'T CARE, DO U?" -- was an odd choice for a visit to a Texas detention center housing immigrant children. When Trump arrived at Joint Base Andrews Thursday morning to travel to Texas, wearing the "I-really-don't-care" jacket with its message emblazoned in white paint, it was first noticed by the Daily Mail. Her spokesperson, Stephanie Grisham, told CBS News in a statement that the writing on Trump's jacket was not intended to send a message. "It's a jacket. There was no hidden message," Grisham said. "After today's important visit to Texas, I hope the media isn't going to choose to focus on her wardrobe." But then Melania Trump wore it back home too. And soon after, the president tweeted that it "refers to the Fake News Media. Melania has learned how dishonest they are, and she truly no longer cares!" The Twitter outcry throughout the day was swift, with many appalled at what seemed to be an ill-conceived -- if unintentional -- message when she was traveling to visit migrant children separated from their parents. "The jacket Melania Trump wore to visit caged immigrant children," one user tweeted. InStyle's comment was simply, "Yikes." 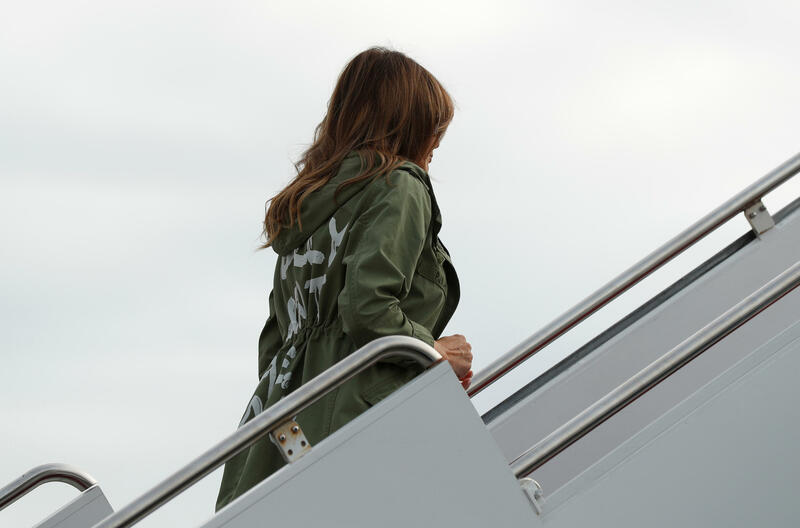 The jacket first appeared only upon her departure -- by the time Trump arrived in McAllen, Texas, the olive drab jacket, a $39 Zara design, was gone, and she walked into the housing facility clad in a cream military-style jacket with white jeans and sneakers. The jacket was part of the Spring-Summer 2016 collection. Grisham had earlier bashed the media for paying so much attention to Melania Trump's sartorial choices. "If media would spend their time & energy on her actions & efforts to help kids - rather than speculate & focus on her wardrobe - we could get so much accomplished on behalf of children," she scolded. She also said the first lady's visit with the children in Texas "impacted @flotus greatly." It was Trump's idea to go to the border to see firsthand how migrant children are being treated, her husband said. "My wife, our first lady, is down now at the border because it really bothered her to be looking at this," President Trump told members of his Cabinet Thursday, just as his wife was landing in Texas to visit a facility where dozens of children are being housed. At the facility the first lady talked with staff about how the children were being treated and asked how she could help. She thanked the staff for their compassion and kindness and said she wanted to hear more about how her husband's administration could build on efforts to reunite children with their families.